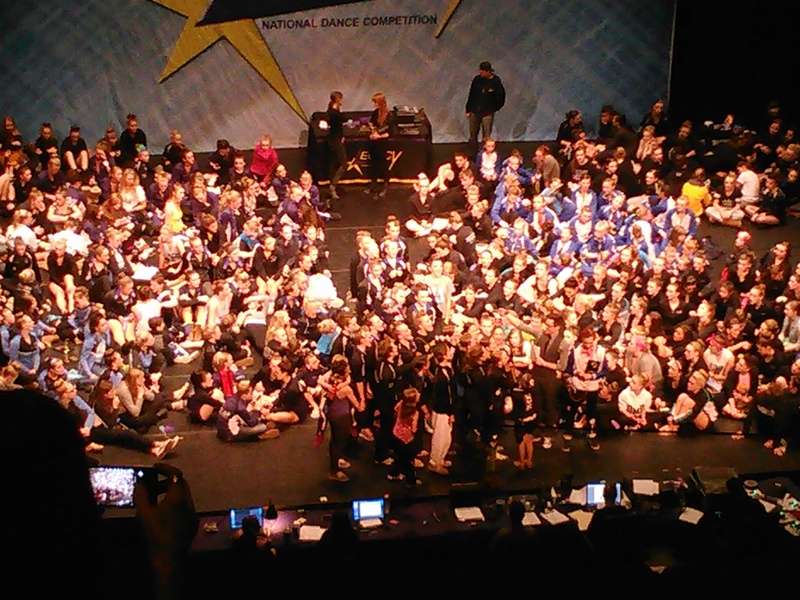 This past weekend was the Legacy Dance Competition. It was held at what used to be called the Burnsville Performing Arts Center, but is now called the Ames Center. It is still my favorite venue for competitions. It’s got great seating, great acoustics, it’s a beautiful building, and in the summer, has an awesome courtyard out front. Yes, the courtyard is there in the winter too, but there are no fountains on for the kids to play in. We did luck out though, in that we had beautiful weather on Sunday. Kids were out playing in the courtyard in shorts and t-shirts, while having a snowball fight. It was both bizarre and awesome at the same time! Legacy earned big points in my book for being almost exactly on time on Friday night!! I appreciated that. My daughter danced her small group first (at 7 something PM). Her group then danced their contemporary, tap, and finally, jazz dances all between 9 and 9:45 PM. Awards were around 10:30. It ended up being a very late night to say the least. Grace’s small group was given an Elite Gold (though, I thought they should have received a Platinum score). They scored 8th over all for Intermediate Junior Small Groups. I sometimes wonder what the judges see or don’t see, but I guess that’s why I’m a Dance Mom, and not a Judge. Grace’s Contemporary, Tap, and Jazz dances all received a Platinum score, and scored 6th, 5th, and 2nd overall respectively (in the Intermediate Junior Large Group division). YAY! We did not attend the competition on Saturday. My daughter was not dancing that day, and we had other things going on. Sunday was a different story, as far as scheduling goes. The Lake Area dancers danced their very first ever production number somewhere around a half hour late. By the time they got to awards, they were about an hour behind schedule. That made for a very long day (since we went early in the morning to watch the youngest dancers from our studio). The production number scored Platinum, and took 1st over all for Intermediate Teen Production. The upside of long competition days, is that we get to see some amazing dances from other studios. Many of the studios that were at this competition were familiar (such as Woodbury Dance Center, DelMonico Dance, Jam Hops, and so many more), but there were a few I hadn’t previously heard of (such as Miss Melinda’s Dance Studio and Short Dance Studio). It’s always fun to see new studios at competitions. Overall, I really like this competition. We always knew awards were coming on stage, because they would play “The Wobble”, and dancers and staff members would all be dancing on the stage. I liked the amount of time they spent at the awards ceremonies talking to the dancers (especially soloists and top placing dances). I heard some parents talking about how they wished they didn’t spend so much time talking to each one, but they worked hard, give them a moment to shine! Yes, awards took longer than at some competitions, but I enjoyed them. I also liked that in the program (which was $10, about average), they had a place to write in the awards and placements. It made the awards ceremonies easy to follow along with, and to be able to take notes. Yes, I am one of those moms. I take notes on scores, placements, etc. No, I rarely ever look at them again once my blog post is written about the competition, but I enjoy doing it, nonetheless. My main criticism about this competition, is one I’m pretty sure I have had about other competitions. When they are playing music while the judges are talking during the awards ceremony, they need to turn it down! It makes it difficult to hear/understand, and it’s very distracting when the music that is supposed to be “background” is equal if not louder than the judge’s microphone. The focus during this time should be on the judges and awards, not the music. One competition down, 3 to go… on to the next one! Basically need to state your own post is as unbelievable. The actual lucidity within your article is merely great as well as i could truthfully suppose you might be a professional on this subject.